So here’s a very significant change to the driver line-ups for the Le Mans 24 Hours. ‘An agreement has today been reached between Pescarolo Sport and Creation Autosportif for Nicolas Minassian to drive with the French team for the 74th running of the 24 Hours of Le Mans’, says the Creation Autosportif statement. The Mike Jankowski / Ian Bickerton team has the perfect replacement in the #9 Creation 06/H Judd – Jamie Campbell-Walter. 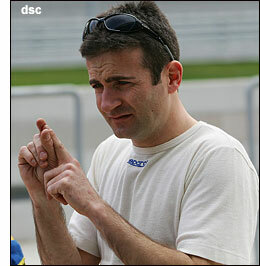 Minassian will return to the Creation team for the balance of the Le Mans Series. “This is a fantastic opportunity for Nic, and a French team, to win Le Mans and we are giving our full support to that objective,” says Mike Jankowski. Henri Pescarolo was keen to employ Minassian at Le Mans last year, but the Frenchman was unwilling to switch teams then. With Jamie Campbell-Walter available to drive the Creation entry this year, all sides have been able to reach an agreement this time. “The Creation team has very sportingly agreed to release Nicolas Minassian and give him the opportunity to try to win the 24 Hours of Le Mans with a team he knows very well and against which he is running in the Le Mans Series,” says Henri Pescarolo. “Pescarolo Sport is very proud and grateful to Michael Jankowski and Ian Bickerton. We’ll have to wait and see where that leaves Christophe Bouchut. His replacement (Nelson Piquet Jnr.) in the #62 Russian Age (Team Modena) Aston Martin had an incident early on in his ten lap run (to qualify for the race) during the June 4 test day. The Brazilian did complete his laps though.